As a historian of drug policy, my natural inclination is to turn to the past. An encounter in the mid-19th century Cambridge market place came to mind. A character in Charles Kingsley’s novel Alton Locke relates what the “druggist’s shop” was selling: “you’ll see the little boxes, doozens and dozens a’ ready on the counter…Opium, bor alive, opium!” Opium was on open sale in the 19th century; after 1868 pharmacists were in charge with minimal regulation. In the absence of much by way of effective therapeutics, the drug was central to medical practice and a mainstay of self-medication—the aspirin or paracetamol of its day. Cannabis was a different matter. Its widespread use in the Far East was never replicated in the home country. Queen Victoria did not, despite recent claims, use cannabis in childbirth, although her physician, William O’Shaughnessy, wanted to introduce the drug into medical practice. Uncertainty of its action limited its use and differentiated cannabis from opium, whose alkaloids, codeine, morphine, and later heroin, gained it a central role in developing professional therapeutics. It is a far cry from the minimal regulation of the 19th century, to the world in which these two books operate. Drug Policy and the Public Good has been written by an impressive team led by Thomas Babor and aims to “evaluate critically the available research on drug policy, and to present it in a way which informs both the policy maker and the scientific community”. Its scope is intended to be comprehensive and international, to inform the debate in countries where research is thin on the ground as well as in those that produce more of it. The book’s contributors write about why people use drugs, who uses drugs, and trends in use. Illicit drug use is associated with a range of harms, disease, disability, mortality, criminality, and other social harms. However, as the authors point out, for most countries, the burdens, harms, and costs of illicit drugs are less than those attributable to alcohol and tobacco. We learn about how and why drug markets operate and their effect on price. Strategies—prevention, services for drug users, supply control, prescription regimes, and criminal sanctions—are carefully examined. Drugs operate within a system of international control that, despite increasingly vociferous attempts from civil society organisations in recent years, shows little sign of change. National policies must conform to these international principles, although the national experience does differ; country studies from Nigeria to Sweden illustrate the point. The book ends with ten conclusions from the evidence: these range from the assurance that there is no “magic bullet” for drug problems, to the importance of a country’s pharmacy system in regulation. Perhaps not so far, then, from the 19th century. Its name may be synonymous with European unity ‑ but increasingly its coffee shops are not. Moves by the Dutch border town of Maastricht to ban foreigners from its marijuana cafes have been upheld by the European court, in a rare contravention of EU laws governing free markets and free movement of people. In response to what it terms an influx of hordes of weed-seeking tourists, mainly from Belgium and France, Maastricht decided to limit admission to coffee shops to Dutch residents only. Every day, some 4,000 tourists in search of the perfect smoke enter Maastricht, according to the major of the town. Some 70% of the town’s coffee-shop customers come from across the border. Marc Josemans, owner and chairman of the Association of Official Maastricht Coffee Shops, brought a legal challenge before the Dutch council of state, arguing that a ban contravenes European legislation on free movement and free trade in goods and services within the EU. The council asked the European court of justice for its interpretation of EU law, which it will then employ in its ruling expected at the end of this year. In his finding, the EU court’s advocate general, Yve Bot, said that narcotics do not count as regular goods because they are against the law. “Narcotics, including cannabis, are not goods like others and their sale does not benefit from the freedoms of movement guaranteed by European Union law, inasmuch as their sale is unlawful,” he said. 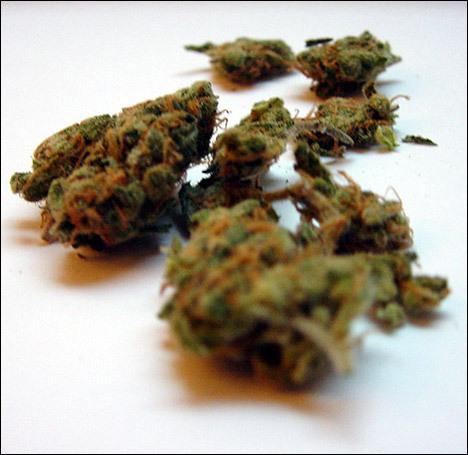 He did add however that in cases of their medical or scientific use, marijuana does “come under internal market rules”. The court said that Maastricht was right to view drug tourism as “a genuine and sufficiently serious threat to public order”, and thus the restriction of foreigners from coffee shops “constitutes a measure necessary to protect the residents of the municipality from trouble”. The finding concluded by saying that backpackers descending upon the Netherlands for a weekend of exuberance and oblivion endangered the European Union’s security. “Drug tourism, in so far as it conceals, in actual fact, international trade in narcotics and fuels organised criminal activities, threatens even the European Union’s internal security,” it said. Last saturday the Dutch newspaper NRC handelsblad published an interview with the head of the Dutch cannabis task force Max Daniel. Obviously the original interview in the newspaper was in Dutch, however NRC has been so kind to provide an version for their English audience. This interview is very interesting because it seems to hold a negative opinion about cannabis and the way the Dutch decriminalisation system works. By doing so however, it presents an excellent case for the legalisation of cannabis. Mr. Daniel points out in this interview that the Dutch cannabis trade is largely controlled by organised crime and that he is planning to crack down on these organisations. At the same time he also points out that it is not his intention to close any of the coffeeshops. As many of you may know coffeeshops are allowed to sell a maximum of 5 grams of cannabis per person to the consumer. At the same time the supply side of these coffeeshops is still illegal. As Mr. Daniel emphasises he wants to stop criminals at the supply side of the cofffeeshop. How is he going to achieve this without closing the coffeeshops? There seems to be somewhat of a contradiction in his statements? There is only one way to achieve this and that is to fully regulate the market, both supply to and from coffeeshops should be legal and regulated, this is the only way to effectively prevent criminal organisations from taking part in the cannabis trade in the Netherlands. Another interesting point is the figure below on Dutch cannabis exports. How do they estimate this figure? Are all the tourist that buy cannabis in a coffeeshop and smoke it in the Netherlands included in these export figures? If they are not, they should be, as by definition this is export too. Does that mean the Dutch government, who taxes the sales in coffeeshops, is part of this “criminal” conspiracy to export Cannabis? Dutch cannabis growers earn around 2 billion euros from exporting marijuana to the rest of the world every year, says police commissioner Max Daniel who heads a task force set up by the government this summer. An interview with the police chief who has been appointed to crack down on criminal organisations involved in the illegal trade.